If you hadn't heard, Shangri-La is doing a Facebook promotion for its 40th Anniversary this year. So long as you're a fan of their page, you can enjoy big discounts in any of their restaurants on your birthday! If you dine with 2 people, it's 50% off; 3 diners is 33% off; 4 diners is 25% off; and 5 or more diners is 20% off. 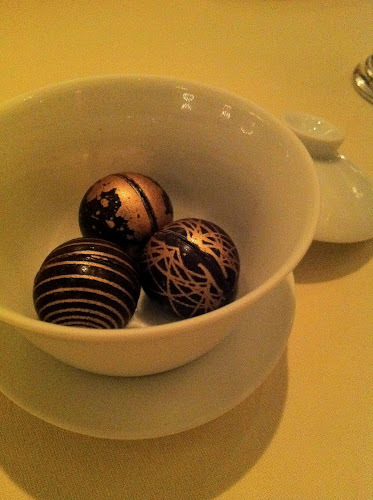 I took full advantage of this last night when I tried out Restaurant Petrus in the Island Shangri-La. For some reason, I had never really considered eating here, thinking it was just going to be pretentious French food in a gaudy setting. However, I was delightfully surprised that (almost) everything I tried was spectacular and the service spot on! Okay I can't remember what this was called or described as but to me it was just a cheesy bread ball. Can't really go wrong with this! This was lovely and light and fresh! I especially enjoyed the cracker which was just the right amount of flaky that it didn't crumble all over my plate when I bit into it. The only thing I'd say is that their amuse-bouches are rather big which I'm not used to. Then again, I shouldn't complain about getting too much of a good thing! First up was bread and butter which I forgot to take photos of - the baguette I chose was as good as the ones I ate in Paris, and delicious with their unsalted butter which I was happy to note came at room temperature so was easily spreadable. You can also sprinkle the bread with an array of salt they offer, coming from as far-flung regions as Tasmania and Hawaii! One note though, they offer seaweed butter too which sounds interesting but just doesn't work. 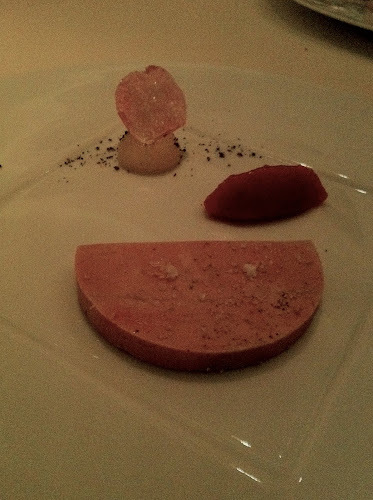 This was the only course I wasn't looking forward to because (i) I don't like duck liver and (ii) I don't like terrines. Luckily, it came with delicious toast and juniper flavoured pumpkin butter (in the background). When that was added to the terrine, it was actually quite okay. One of my favourite dishes of the night! The calamari was stuffed with rice and was flavoured with XO sauce of all things! They also drizzled on lobster broth which was pretty spectacular, not to mention the dollop of squid ink on the side which I happily scraped up with my calamari. The ham was also outstanding. This fish was cooked really well and I loved how it flaked off my fork (didn't even need a knife!) It was actually delicious without the bean puree which I didn't like too much. Ironically though, I did really enjoy the beans that were sprinkled around the plate. There were also a few cockles which were meh but that's okay 'cause the fish was yum! Never tried bernard antony cheese so I was super excited!! 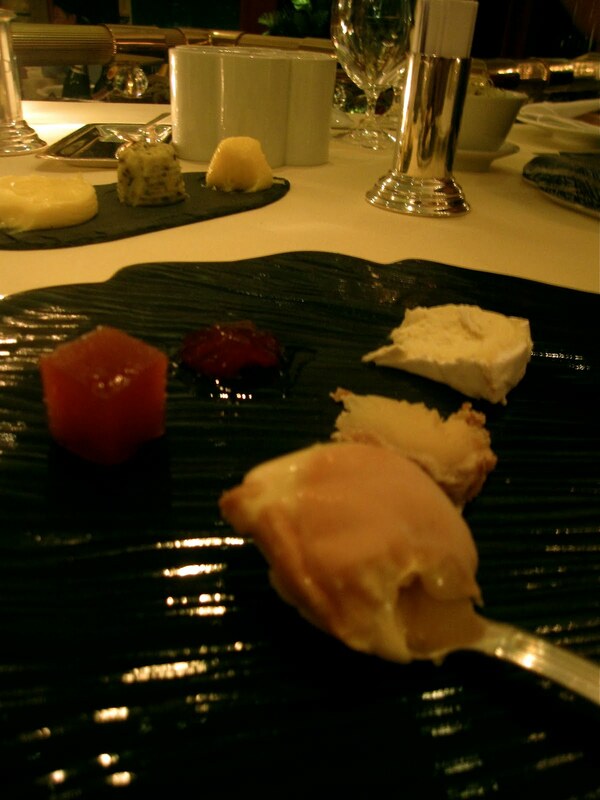 I chose epoisses (my favourite) and then Katie, our wonderful server, selected two others for me. The epoisses was amazing and I'm so glad they put it on a spoon because I just ate off it - totally didn't need to be spread on anything haha. Worked particularly well with the quince and elderberry jam in the background! I was surprised how amazing this was. 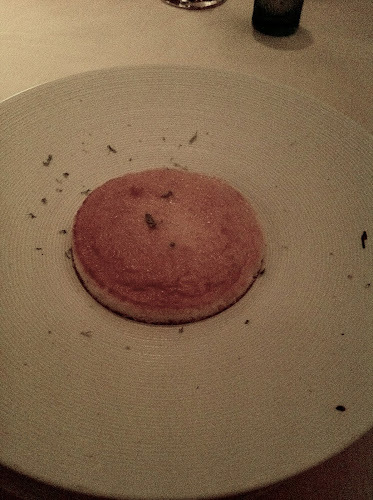 The souffle was baked perfectly with the perfect balance of sour and sweet. The innards were so gooey and warm :) Very delicious! I scraped up every last bit in the bowl and really wished it came in a bigger size despite how full I was already feeling! We ended this near perfect meal with some petits fours and deliciously soothing peppermint tea. Such a perfect meal and with the discount, the total bill only came up to $1300 with service charge included! Amazing! I was particularly impressed with the service. Our server, Katie, was really knowledgeable and explained each of our dishes to us with obvious passion. She helped us take dozens of photos, always greeted us with a smile, and was just a delight to have around! I was also happy to note that once we finished one bottle of water, they didn't immediately open a new one without asking us. In fact, they brought us ice water instead and even got a new glass to put it in so as not to mix it with the other water! Now that's service. A spectacular meal that I'd highly recommend, even if you don't get the 50% discount. But for all those who have their birthdays in the next few months, definitely sign up to be a Shangri-La fan and make the most of this amazing offer!